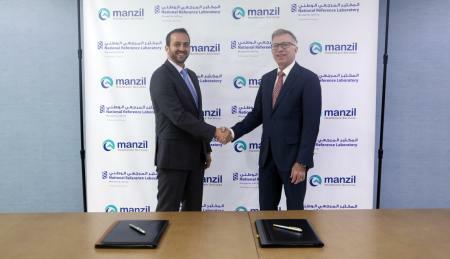 Abu Dhabi-UAE National Reference Laboratory (NRL), a Mubadala Investment company, and Manzil Healthcare Services (Manzil), a leading provider of professional, individualized homecare and rehabilitation services based in Abu Dhabi, have signed two agreements aimed at supporting the growing demand for personalized home healthcare in the UAE. As part of the collaboration, NRL will provide high quality laboratory services for Manzil patients, while Manzil will supply specialized healthcare professionals to support NRLs sample collection services, thus improving diagnosis and treatment outcomes in outpatients. The public-private partnership will help to reduce pressure on the UAEs healthcare infrastructure at a time of growing demand for professional home healthcare for adult and pediatric patients, driven by the growing incidence of non-communicable diseases, birth defects, and other life-changing medical incidents such as strokes. It also supports the UAEs Vision 2021 National Agenda, which aims to make the UAE among the best countries in the world in terms of quality of healthcare.